In the meantime, in a small saucepan over medium heat add water, honey, and arrowroot. Whisk together. Next add in fresh raspberries and blackberries. Stir and let simmer for 10 minutes. Remove from heat and store in refrigerator until cooled. 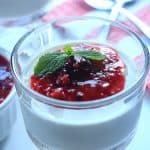 Serve panna cotta with mixed berry compote.